/ Home / Press office / Amazing Grace! 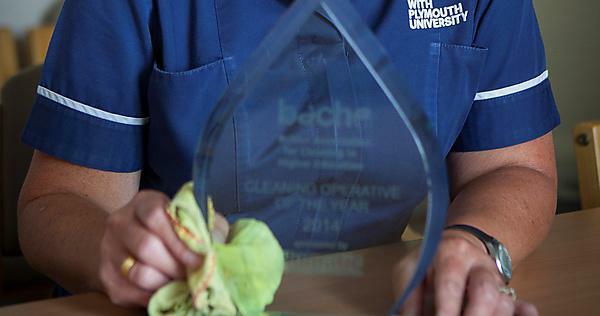 Grace Harrison was nominated by her manager for the British Association of Cleaning in Higher Education (BACHE), which recognise the exemplary work of support staff in three categories - Cleaning Operative of the Year, Best Practice Award and Customer Service Award. I was surprised enough to find out I had been nominated in the first place. I do my job like everyone else, so to receive this kind of recognition is a real honour. Grace started working at Plymouth University on a part-time basis in 2009. She has since increased her hours and is now responsible for three buildings. Beyond this, Grace works on applicant days, open days and special events held in the evenings of weekends. The British Association of Cleaning in Higher Education was launched in 2004 to help standardise training and share best practices in institutions in the UK and Ireland. The ceremony was held at Glasgow Caledonia University with a gala dinner reception evening in June, where Grace was presented with an engraved crystal trophy.